JNK-IN-8 is the first irreversible JNK inhibitor for JNK1, JNK2 and JNK3 with IC50 of 4.7 nM, 18.7 nM and 1 nM, >10-fold selectivity against MNK2, Fms and no inhibition to c-Kit, Met, PDGFRβin A375 cell line. The viability of DLBCL cell lines was assessed after 72 h of treatment with the indicated concentrations of the JNK inhibitor JNK-IN-8. Mean + SEM of at least three independent experiments is shown. J Exp Med, 2015, 212(5): 775-92. JNK-IN-8 purchased from Selleck. Striatal slices from 6-OHDA-lesion mice were incubated for 5 min with vehicle, SKF38393 (3 μM), or SKF38393 in the presence of SP600125 (20 μM) or JNK-IN-8 (10 μM). P-cJun and P-ERK 1/2 were determined by Western blotting (25 and 10 μg of protein were loaded, respectively). Note the reduction of SKF38393-induced P-cJun produced by the two JNK inhibitors (top panels). In contrast, SP600125 and JNK-IN-8 did not affect the increase in P-ERK 1/2 produced by SKF38393 (bottom panels). Summary of data were calculated as percentage of control and are represented as mean ± S.E.M. 1 W ANOVA indicated significant effect of the treatment for both P-cJun (F3,16 = 15.22, p < 0.0001, n = 5 slices from 5 mice) and P-ERK 1/2 (F3,16 =18.23, p < 0.0001, n= 5 slices from mice). Neurobiol Dis, 2018, 110:37-46. JNK-IN-8 purchased from Selleck. ICT induces JNK activation, mediating mPTP opening and CRC cell necrosis. JNK expression (p- and regular) in HT-29 or the primary CRC cells stimulated with applied ICT was tested by Western blots (a). HT-29 cells were pre-treated with JNK inhibitors SP600125 (SP), JNK inhibitor IX (JNK-IX), and JNK-IN-8 (JNKi-8) (5 μM each) for 1 h, followed by ICT (25 μM) stimulation, MMP decrease was tested by JC-10 dye assay (b, after 12 h), and cell necrosis was tested by LDH release assay (c, after 72 h). Tumour Biol, 2016, 37(3):3135-44. JNK-IN-8 purchased from Selleck. SCC-9 cells were pre-treated with JNK inhibitor SP 600125 (1 umol/L) or JNK-IN-8 (1 umol/L) for 1 h, cells were also stimulated with indicated AZD8055 and cultured for 72 h, cell survival was analyzed. Scramble RNAi or JNK1/2 RNAi (JNK RNAi-1 or JNK RNAi-2, see methods) transfected HEK-293 cells were stimulated with AZD8055, cells were further cultured for 72 h before cell survival was tested. Biochem Biophys Res Commun 2013 440(4), 701-6. JNK-IN-8 purchased from Selleck. JNK-IN-8 and JNK-IN-7 are structurally very similar, but whereas the former is a specific covalent inhibitor of JNKs. Zhang T, et al. Chem Biol, 2012, 19(1), 140-154. Goh ET, et al. Biochem J, 2012, 441(1), 339-346. Liu Q, et al. Chem Biol, 2013, 20(2), 146-159. Anisomycin is an antibiotic, which inhibits protein synthesis, and also act as a JNK activator. SP600125 is a broad-spectrum JNK inhibitor for JNK1, JNK2 and JNK3 with IC50 of 40 nM, 40 nM and 90 nM in cell-free assays, respectively; 10-fold greater selectivity against MKK4, 25-fold greater selectivity against MKK3, MKK6, PKB, and PKCα, and 100-fold selectivity against ERK2, p38, Chk1, EGFR etc. 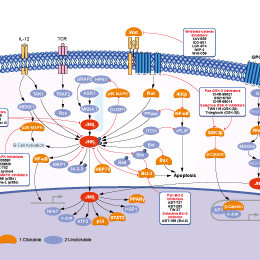 JNK inhibitor IX is a selective and potent JNK inhibitor with pIC50 of 6.5 and 6.7 for JNK2 and JNK3, respectively. Features:A novel and potent inhibitor of the B-RAFV600E oncoprotein. 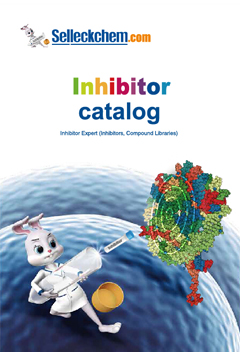 SB203580 is a p38 MAPK inhibitor with IC50 of 0.3-0.5 μM in THP-1 cells, 10-fold less sensitive to SAPK3(106T) and SAPK4(106T) and blocks PKB phosphorylation with IC50 of 3-5 μM.